Since his first solo exhibition in 1980, Koons’s work has been shown in major galleries and institutions throughout the world. His Celebration sculptures were the subject of exhibitions on the rooftop of the Metropolitan Museum of Art in New York and at the Neue Nationalgalerie in Berlin. Château de Versailles opened its doors to a living artist for the first time with Jeff Koons: Versailles, where a selection of his works were presented within the Grand Apartments. The Whitney Museum of American Art is presenting the most comprehensive survey of Koons’s career to date, Jeff Koons: A Retrospective (through October 19, 2014), which will also travel to the Pompidou Centre Paris in November, and to the Guggenheim Museum Bilbao in June 2015. Koons earned renown for his public sculptures, such as the monumental floral sculpture Puppy (1992), shown at Rockefeller Center and permanently installed at the Guggenheim Bilbao. 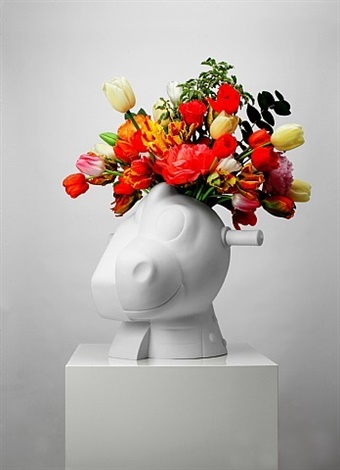 Another floral sculpture, Split-Rocker(2000), previously installed at the Papal Palace in Avignon, Château de Versailles, and Fondation Beyeler Basel, was most recently on view at Rockefeller Center in 2014.
eff Koons has received numerous awards and honors in recognition of his cultural achievements. Notably, Koons received the Governor’s Awards for the Arts “Distinguished Arts Award” from the Pennsylvania Council on the Arts; the “Golden Plate Award” from the Academy of Achievement; President Jacques Chirac promoted Koons to Officier de la Legion d’Honneur; and Secretary of State Hillary Rodham Clinton honored Koons with the State Department’s Medal of the Arts for his outstanding commitment to the Art in Embassies Program and international cultural exchange. Koons has been a board member of The International Centre for Missing & Exploited Children (ICMEC) since 2002, and co-founded the Koons Family International Law and Policy Institute with ICMEC; for the purpose of combating global issues of child abduction and exploitation and to protect the world’s children.